Hello! It's Rebecca and Paula from Sea Island Drive! We're back with the fourth feature in our series, Two Styles, One Room. 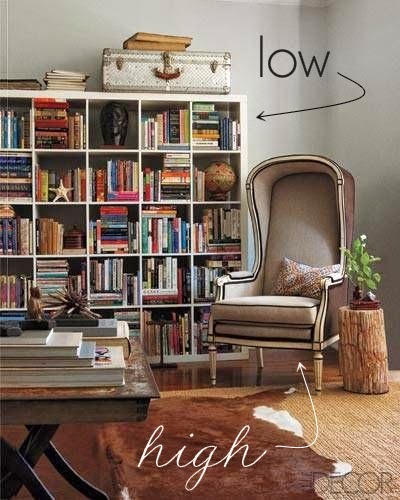 Today we're talking about a combination that everyone can apply to their home...high meets low (price, that is). This living room does such a great job of layering details and price levels to create a rich, inviting feel without breaking the bank. The always cost effective sisal rug is layered with a cowhide to dress it up a bit. The vintage porter's chair and antique table are the perfect compliments to everyone's favorite budget-friendly Ikea bookshelf. So, why does this combination work so well? The ornate styling of the porter's chair and the well worn finish on the antique table add depth and texture to the room that juxtapose and compliment the clean, sleek lines of the bookshelf. Loads of books layered with accessories and keepsakes bring it all together, pulling the finished look of the shelf to a more rich, adorned place. And, of course, sisal is the perfect material to bridge the two styles. It is fresh and clean and free of color and pattern, but warm and rich and always feels like it is meant to really be lived in, not just admired. We love this look, and love the idea of mixing high end with more wallet-friendly pieces. Budgets don't always allow for the purchase of all high-end pieces. But, just as a great handbag will dress up a simple pair of jeans and a Gap shirt, a really great accent chair or a fabulous piece of art or a restored vintage chandelier can dress up a room furnished with otherwise budget-friendly pieces. Over time, as your budget allows, you can continue to layer in more high-end furnishings without ever breaking the bank. That is my motto with my home and my wardrobe--Gap jeans mixed with Tory Burch flats to dress it up! Our budget doesn't allow for too many high pieces in our home; but, we like to load up on the low pieces with great style. I find Target, West Elm, and Ikea are always great places to look! Our big purchases, like a couch from Room & Board, or an Eames chair we will always have are good anchors in a room. Thanks for sharing!